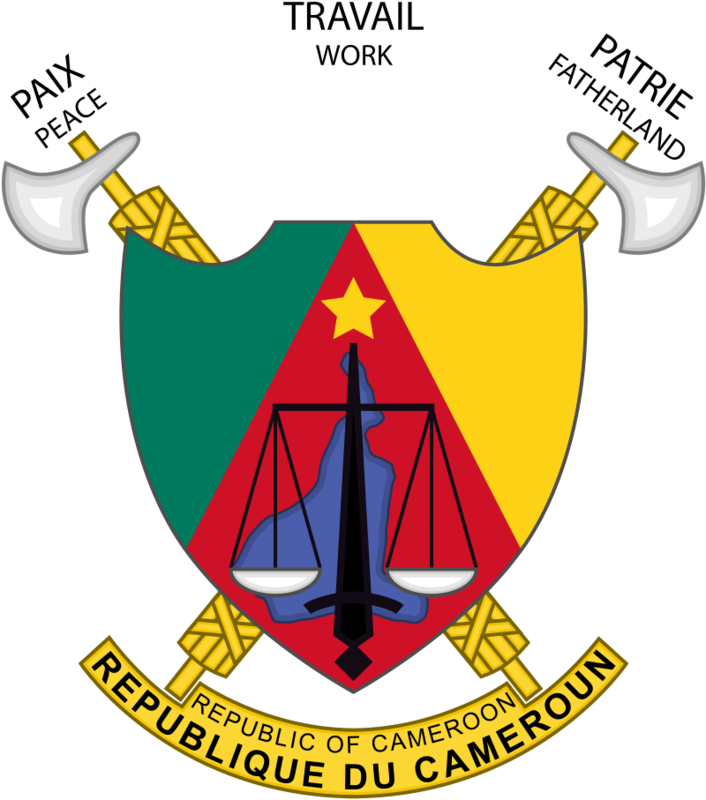 Cameroon (French: Cameroun), officially the Republic of Cameroon (French: République du Cameroun), is a country in Central Africa. It is bordered by Nigeria to the west and north; Chad to the northeast; the Central African Republic to the east; and Equatorial Guinea, Gabon and the Republic of the Congo to the south. Cameroon's coastline lies on the Bight of Biafra, part of the Gulf of Guinea and the Atlantic Ocean. Although Cameroon is not an ECOWAS member state, it geographically and historically is in West Africa with the Southern Cameroons which now form her Northwest and Southwest Regions having a strong West African history. The country is sometimes identified as West African and other times as Central African due to its strategic position at the crossroads between West and Central Africa. Motto: "Paix – Travail – Patrie" (French); "Peace – Work – Fatherland" (English). 10 May 1957 National Anthem adopted. 02 Jun 1972 United Republic of Cameroon. Constitution. Territorial Disputes: Joint Border Commission with Nigeria reviewed 2002 ICJ ruling on the entire boundary and bilaterally resolved differences, including June 2006 Greentree Agreement that immediately ceded sovereignty of the Bakassi Peninsula to Cameroon with a full phase-out of Nigerian control and repatriation of residents on 14 Aug 2008. Cameroon and Nigeria agreed on maritime delimitation in March 2008. Sovereignty dispute between Equatorial Guinea and Cameroon over an island at the mouth of the Ntem River; only Nigeria and Cameroon have heeded the Lake Chad Commission's admonition to ratify the delimitation treaty, which also includes the Chad-Niger and Niger-Nigeria boundaries. Capital: Douala (Buea 1901-1914; Kamerunstadt 1885-1901). Theodor Steinhausen..............................Aug 1910 - Sep 1910 d. 19..
British Baptist Missionary Society at Ambas Bay. to the Oil Rivers Protectorate under Nigeria). to the Basel Evangelical Missionary Society. 28 Mar 1887 Ambas Bay ceded to Germany by U.K., part of German Kamerun. He was British Consul at Oil Rivers Protectorate. 26 Sep 1914 French and British occupation of German Kamerun. 28 Jun 1919 Formal division into French and British Cameroons. 20 Jul 1920 British Cameroons a League of Nations mandate. 13 Dec 1946 Cameroons a British United Nations trust territory. Bamenda) and Southern (capital Buea). 01 Oct 1954 An autonomous part of Nigeria. Cameroon, northern part unites with Nigeria in 01 Jun 1961. James Macrae Simpson......................................1943 - 194. Capital: Yaoundé (Douala 1916-1922, 1940-1946). 25 May 1921 Occupied Territories of Former Cameroon renamed Cameroon Territories. He was acting to 07 Dec 1919. He was acting to 22 Sep 1932. Currency: The Central African CFA franc (French: franc CFA or simply franc, ISO 4217 code: XAF) is the currency of six independent states in Central Africa: Cameroon, Central African Republic, Chad, Republic of the Congo, Equatorial Guinea and Gabon. 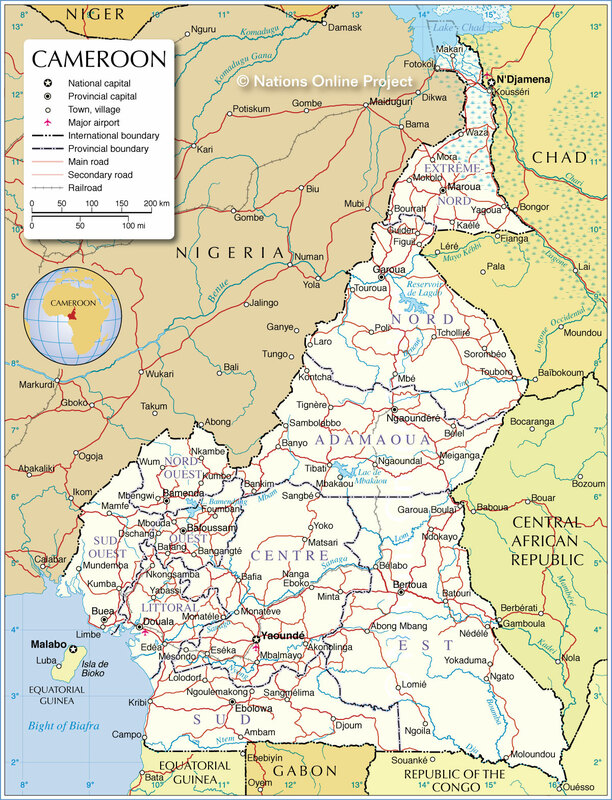 The Bank of Central African States (French: Banque des États de l'Afrique Centrale, BEAC) is a central bank, located at Cameroon's capital: Yaoundé, that serves these six central African countries which form the Economic and Monetary Community of Central Africa. These six countries have also issued normal circulation coins on their name in various years as well. KM#4 50 centimes. Year: 1943. Weight: 2.81g [2.75g]. Metal: Bronze. Diameter: 20.00 mm. Edge: Plain. Alignment: Coin. Mint: Pretoria, South Africa. 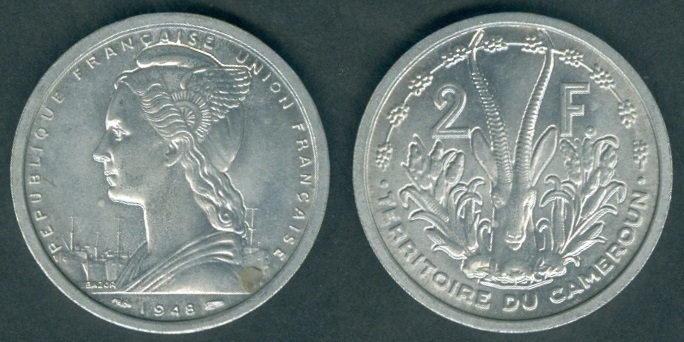 Obverse: Motto of France "LIBERTE.EGALITE.FRATERNITE." (Freedom Equality Fraternity) in two lines banner at the top. Croix de Lorraine (The Patriarchal cross / Archiepiscopal cross) in the center divides the Value "50 CMES". "S A" mint mark written at the top of the cross and "C L S" engraver's initials at the bottom of the cross. "HONNEUR" (Honor) written clockwise on the left side and "PATRIE" (Fatherland) written clockwise at the right side. Date at the bottom with sun design on its both sides. Reverse: Rooster facing left in the center with small shield above it. "CAMEROUN FRANÇAIS" (French Cameroon) written at the bottom. Mintage: 4,000,000. Minted Years: One year type. Engraver: Coert Laurens Steynberg. 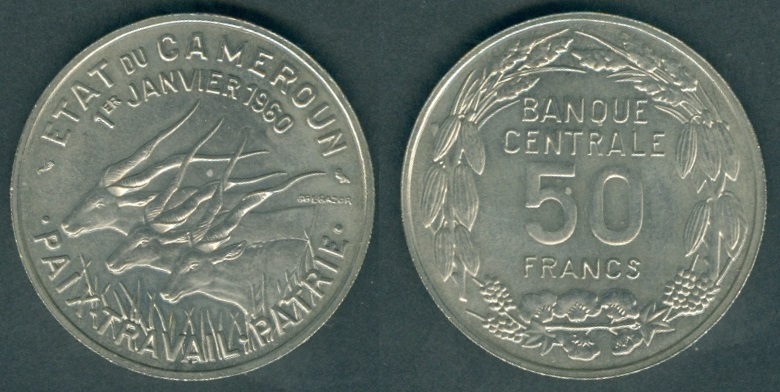 Note: KM#6 50 centimes has "CAMEROUN FRANÇAIS LIBRE" written instead of "CAMEROUN FRANÇAIS". KM#6 50 centimes. Year: 1943. Weight: 2.80g [2.75g]. Metal: Bronze. Diameter: 20.00 mm. Edge: Plain. Alignment: Coin. Mint: Pretoria, South Africa. 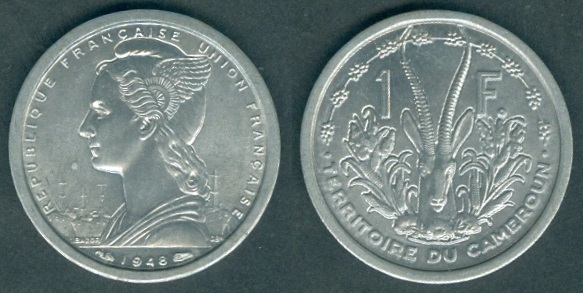 Obverse: Motto of France "LIBERTE.EGALITE.FRATERNITE." (Freedom Equality Fraternity) in two lines banner at the top. Croix de Lorraine (The Patriarchal cross / Archiepiscopal cross) in the center divides the Value "50 CMES". "S A" mint mark written at the top of the cross and "C L S" engraver's initials at the bottom of the cross. "HONNEUR" (Honor) written clockwise on the left side and "PATRIE" (Fatherland) written clockwise at the right side. Date at the bottom with sun design on its both sides. Reverse: Rooster facing left in the center with small shield above it. "CAMEROUN FRANÇAIS LIBRE" (Free French Cameroon) written at the bottom. Mintage: 4,000,000. Minted Years: One year type. Engraver: Coert Laurens Steynberg. KM#5 Franc. Year: 1943. Weight: 5.51g [5.55g]. Metal: Bronze. Diameter: 25.00 mm. Edge: Plain. Alignment: Coin. Mint: Pretoria, South Africa. Obverse: Motto of France "LIBERTE.EGALITE.FRATERNITE." (Freedom Equality Fraternity) in two lines banner at the top. Croix de Lorraine in the center divides the Value "1 Fc". "S A" mint mark written at the top of the cross and "C L S" engraver's initials at the bottom of the cross. "HONNEUR" (Honor) written clockwise on the left side and "PATRIE" (Fatherland) written clockwise at the right side. Date at the bottom with sun design on its both sides. Reverse: Rooster facing left in the center with small shield above it. "CAMEROUN FRANÇAIS" (French Cameroon) written at the bottom. Mintage: 3,000,000. Minted Years: One year type. Engraver: Coert Laurens Steynberg. 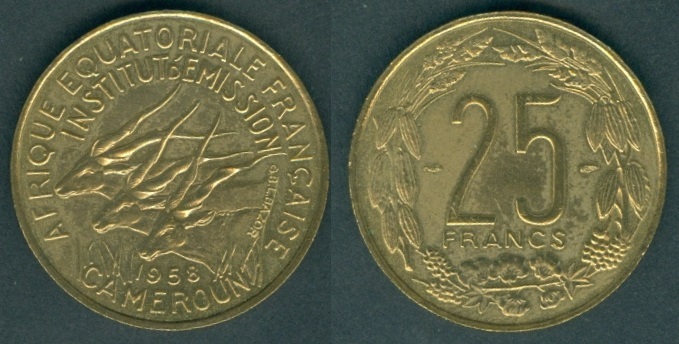 Note: KM#7 1 Franc has "CAMEROUN FRANÇAIS LIBRE" written instead of "CAMEROUN FRANÇAIS". KM#8 Franc. Year: 1948. Weight: 1.30g [1.30g]. Metal: Aluminum. Diameter: 23.00 mm. Edge: Plain. Alignment: Coin. Mint: Monnaie de Paris (mintmark: wing). Obverse: Marianne's head, facing left, wearing a winged Phrygian cap. "REPUBLIQUE FRANÇAISE UNION FRANÇAISE" (French Republic French Union) written around Marianne's head. Four ships in the background. Engraver initials "L.BAZOR" written at bottom left side and "GB" at bottom right side. Date below exergue line, followed by privy mark on both sides. Reverse: A linked sorghum (an agricultural food crop) with 10 bunches at the top. Leptoceros gazelle head facing straight in the center divides Value (denomination) "1 F.". Stalks of maize crops in the background. "TERRITOIRE DU CAMEROUN" (Territory of Cameroon) written at the bottom section. Mintage: 8,000,000. Minted Years: One year type. Engraver: Lucien Georges Bazor. Note: ESSAI (pattern) type exists as KM#E5 in Copper-Nickel, weight: 5.30 grams with mintage: 2,000. KM#9 2 Francs. Year: 1948. Weight: 2.29g [2.20g]. Metal: Aluminum. Diameter: 27.00 mm. Edge: Plain. Alignment: Coin. Mint: Monnaie de Paris (mintmark: wing). Obverse: Marianne's head, facing left, wearing a winged Phrygian cap. "REPUBLIQUE FRANÇAISE UNION FRANÇAISE" (French Republic French Union) written around Marianne's head. Four ships in the background. Engraver initials "L.BAZOR" written at bottom left side and "GB" at bottom right side. Date below exergue line, followed by privy mark on both sides. Reverse: A linked sorghum (an agricultural food crop) with 10 bunches at the top. Leptoceros gazelle head facing straight in the center divides Value (denomination) "2 F.". Stalks of maize crops in the background. "TERRITOIRE DU CAMEROUN" (Territory of Cameroon) written at the bottom section. Mintage: 5,000,000. Minted Years: One year type. Engraver: Lucien Georges Bazor. Note: ESSAI (pattern) type exists as KM#E6 in Copper-Nickel, weight: 10.00 grams with mintage: 2,000. KM#10 5 Francs. Year: 1958. Weight: 2.96g [3.00g]. Metal: Aluminum-Bronze. Diameter: 20.00 mm. Edge: Plain. Alignment: Coin. Mint: Monnaie de Paris (mintmark: wing). Obverse: "AFRIQUE EQUATORIALE FRANCAISE" (French Equatorial Africa) written at the top section and "INSTITUT D'EMISSION" (Emission Institute) written below it. Heads of three Giant Elands facing left in the center with grassland below them. Engraver initials "G.B.L.BAZOR" written at right side in smaller characters clockwise. "CAMEROUN" (Cameroon) written at the bottom with Date below it. 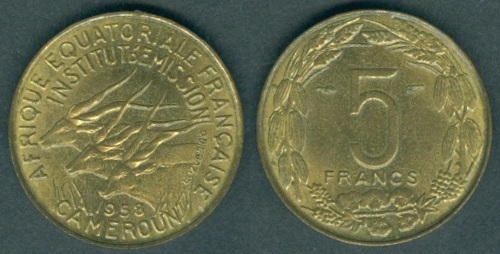 Reverse: Numeral "5" in the center with "FRANCS" written below it. Privy mint mark on both sides, at the upper part of numeral "5". Circular Wreath with local crops surrounds the Value with knot at the bottom. Mintage: 30,000,000. Minted Years: One year type. Engraver: Gabriel Bernard / Lucien Georges Bazor. Note: ESSAI (pattern) type also exists as KM#E7, having mintage: 2,030. The giant eland is also known as the Lord Derby eland. Binomial Name: Taurotragus derbianus. KM#11 10 Francs. Year: 1958. Weight: 4.03g [4.00g]. Metal: Aluminum-Bronze. Diameter: 23.00 mm. Edge: Plain. Alignment: Coin. Mint: Monnaie de Paris (mintmark: wing). Obverse: "AFRIQUE EQUATORIALE FRANCAISE" (French Equatorial Africa) written at the top section and "INSTITUT D'EMISSION" (Emission Institute) written below it. Heads of three Giant Elands facing left in the center with grassland below them. Engraver initials "G.B.L.BAZOR" written at right side in smaller characters clockwise. "CAMEROUN" (Cameroon) written at the bottom with Date below it. 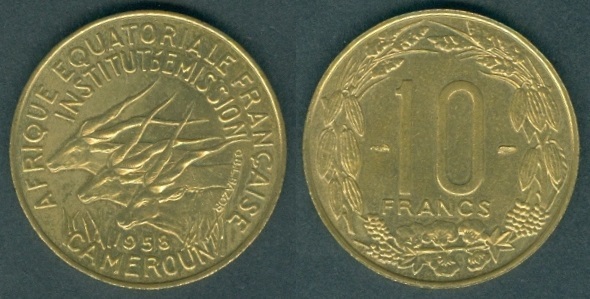 Reverse: Numerals "10" in the center with "FRANCS" written below it. Privy mint mark on both sides. Circular Wreath with local crops surrounds the Value with knot at the bottom. Mintage: 25,000,000. Minted Years: One year type. Engraver: Gabriel Bernard / Lucien Georges Bazor. Note: ESSAI (pattern) type also exists as KM#E8, having mintage: 2,030. KM#12 25 Francs. Year: 1958. Weight: 8.02g [8.00g]. Metal: Aluminum-Bronze. Diameter: 27.00 mm. Edge: Reeded. Alignment: Coin. Mint: Monnaie de Paris (mintmark: wing). Obverse: "AFRIQUE EQUATORIALE FRANCAISE" (French Equatorial Africa) written at the top section and "INSTITUT D'EMISSION" (Emission Institute) written below it. Heads of three Giant Elands facing left in the center with grassland below them. Engraver initials "G.B.L.BAZOR" written at right side in smaller characters clockwise. "CAMEROUN" (Cameroon) written at the bottom with Date below it. 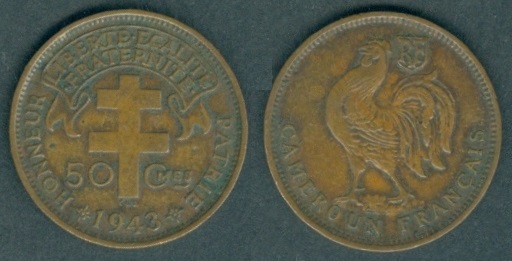 Reverse: Numerals "25" in the center with "FRANCS" written below it. Privy mint mark on both sides. Circular Wreath with local crops surrounds the Value with knot at the bottom. Mintage: 12,000,000. Minted Years: One year type. Engraver: Gabriel Bernard / Lucien Georges Bazor. Note: ESSAI (pattern) type also exists as KM#E9, having mintage: 2,030. He was himself Prime minister as well. Post abolished: 25 Jan 1984 - 26 Apr 1991. KM#13 50 Francs. Year: 1961. Weight: 12.05g [12.00g]. Metal: Copper-Nickel. Diameter: 31.00 mm. Edge: Reeded. Alignment: Coin. Mint: Monnaie de Paris (mintmark: wing). Obverse: "BANQUE CENTRALE" (Central Bank) written at the top section. Heads of three Giant Elands facing left in the center with grassland below them. Engraver initials "G B·L BAZOR" written at right side in smaller characters anti-clockwise. "·REP··CENTRAFRICAINE·CONGO·GABON·TCHAD" (Central African Republic, Congo, Gabon Chad) written at the bottom section with Date below it. Reverse: Numerals "50" in the center with "FRANCS" written below it. Privy mint mark on both sides, at the base of numerals "50". Circular Wreath surrounds the Value with knot at the bottom. Mintage: 9,000,000. Minted Years: 1961 and 1962. Engraver: Gabriel Bernard / Lucien Georges Bazor. Note: ESSAI (pattern) type also exists as KM#E10, having mintage: 1,500. KM#14 100 Francs. Year: 1966. Weight: 11.89g [12.00g]. Metal: Nickel. Diameter: 25.00 mm. Edge: Reeded. Alignment: Coin. Mint: Monnaie de Paris (mintmark: owl). Obverse: Date at the top. 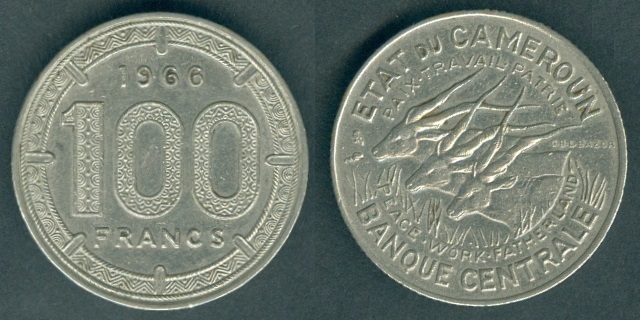 Numeral "100" in the center with "FRANCS" written below it. Date and value within circular design. Reverse: "ETAT DU CAMEROUN" (State of the Cameroon) written at the top section and "PAIX·TRAVAIL·PATRIE" (Peace·Work·Fatherland) written below it. Heads of three Giant Elands facing left in the center with grassland below them. Two Privy mint marks on left side near the border. Engraver initials "GB·L·BAZOR" written at right side in smaller characters. "PEACE·WORK·FATHERLAND" written below the Giant Elands. "BANQUE CENTRALE" (Central Bank) written at the bottom section. Mintage: 4,000,000. Minted Years: 1966, 1967 and 1968. Engraver: Gabriel Bernard / Lucien Georges Bazor. Note: ESSAI (pattern) type also exists as KM#E11, having mintage: 1,200. Year: 1967. Weight: 12.05 [12.00g]. Mintage: 4,000,000. Mint: Monnaie de Paris (mintmark: owl). Year: 1968. Weight: 12.17 [12.00g]. Mintage: 5,000,000. Mint: Monnaie de Paris (mintmark: owl). KM#15 100 Francs. Year: 1971. Weight: 6.70g [7.00g]. Metal: Nickel. Diameter: 25.00 mm. Edge: Reeded. Alignment: Coin. Mint: Monnaie de Paris (mintmark: owl). Obverse: "BANQUE CENTRALE" (Central Bank) written in banner at the top. 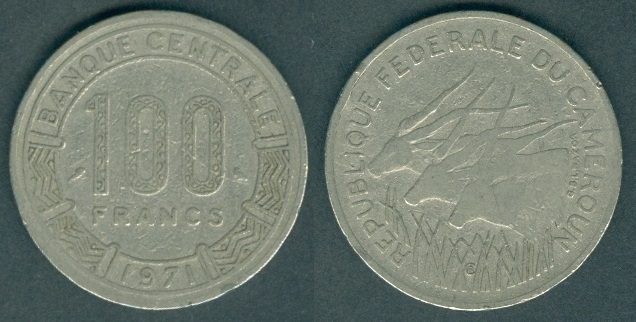 Numerals "100" with "FRANCS" written below it in the center. Design on both sides. Date written in banner at the bottom. 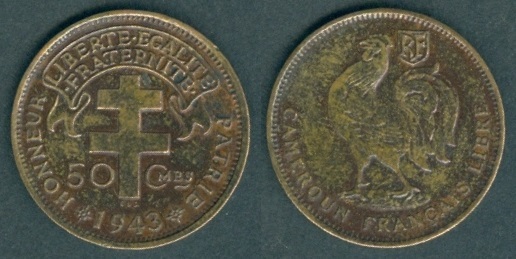 Reverse: "REPUBLIQUE FEDERALE DU CAMEROUN" (Federal Republic of Cameroon) written at the top. Heads of three Giant Elands facing left in the center with grassland below them. Engraver initials "G.B.L.BAZOR" written at right side in smaller characters anti-clockwise. Mintage: 9,000,000. Minted Years: 1971 and 1972. Engraver: Gabriel Bernard / Lucien Georges Bazor. Note: ESSAI (pattern) type also exists as KM#E13, having mintage: 1,550 and as KM#E14 in gold with mintage: 6 pieces only. KM#16 100 Francs. Year: 1972. Weight: 6.96g [7.00g]. Metal: Nickel. Diameter: 25.00 mm. Edge: Reeded. Alignment: Coin. Mint: Monnaie de Paris (mintmark: owl). Obverse: "BANQUE CENTRALE" (Central Bank) written in banner at the top. 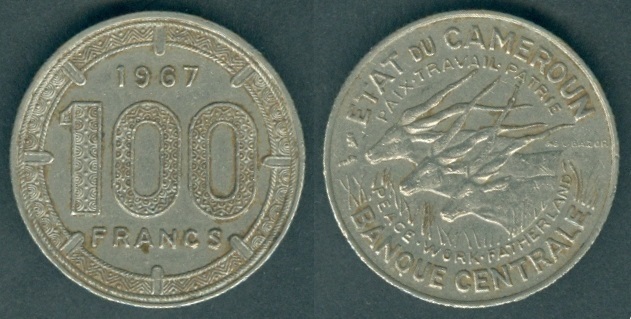 Numerals "100" with "FRANCS" written below it in the center. Design on both sides. Date written in banner at the bottom. Reverse: "CAMEROUN - CAMEROON" (Cameroon) written in French and English at the top. Heads of three Giant Elands facing left in the center with grassland below them. Engraver initials "G.B.L.BAZOR" written at right side in smaller characters anti-clockwise. Mintage: 4,000,000. Minted Years: One year type. Engraver: Gabriel Bernard / Lucien Georges Bazor. Note: ESSAI (pattern) type also exists as KM#E15, having mintage: 1,550. KM#17 100 Francs. Year: 1986. Weight: 6.93g [7.00g]. Metal: Nickel. Diameter: 25.00 mm. Edge: Reeded. Alignment: Coin. Mint: Monnaie de Paris (mintmark: fish). Obverse: "BANQUE DES ETATS DE L'AFRIQUE CENTRALE" (Bank of the Central African States) written in two lines banner at the top. Numerals "100" written in the center. "FRANCS" written below numeral 100 and Date written below it in the center. Design on both sides and at the bottom. 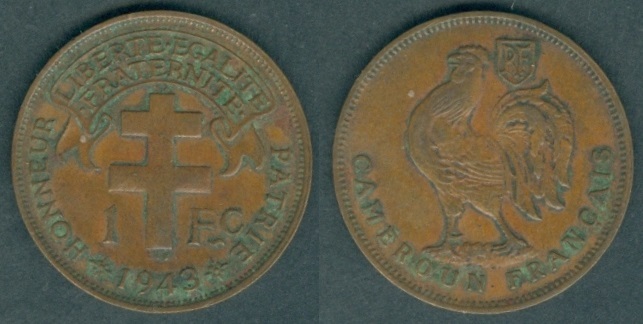 Reverse: "CAMEROUN - CAMEROON" (Cameroon) written in French and English at the top. Heads of three Giant Elands facing left in the center with grassland below them. Engraver initials "G.B.L.BAZOR" written at right side in smaller characters anti-clockwise. Mintage: 4,000,000. Minted Years: 1975, 1980, 1982, 1983, 1984 and 1986 (fish mint marks for all Dates). Engraver: Gabriel Bernard / Lucien Georges Bazor. Note: ESSAI (pattern) type also exists as KM#E16 dated 1975, having mintage: 1,700. Various design of coins of limited mintage were produced by African mint for Cameroon in 2003, 2005, 2006 and 2007. X#25 750 CFA Francs (½ AFRICA). Year: 2005. Weight: 5.08g. Metal: Cobalt plated Nickel. Diameter: 21.85 mm. Edge: Plain. Alignment: Medal. Mint: Africa Mint. 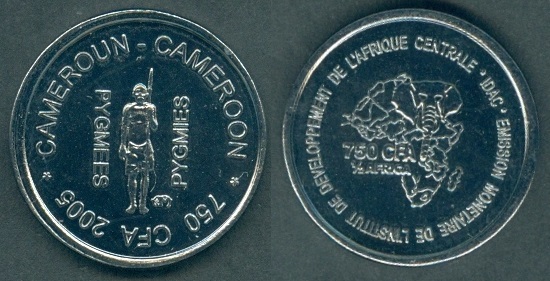 Obverse: "CAMEROUN - CAMEROON" (Cameroon) written in French and English at the top. Tribal man standing straight with spear in his left hand in the center. "EM" initials of the engraver at bottom right side of the Tribal man's feet. "PYGMEES" written top to bottom on the left side and "PYGMIES" written bottom to top on the right side of the Tribal man. One star each at the bottom left section and bottom right section near the border. "750 CFA 2005" written at the bottom clockwise (appears upside down). Reverse: Elephant face on Africa Map in the center. 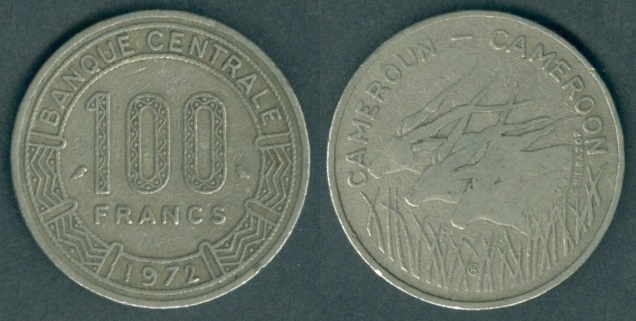 Value "750 CFA" and "½ AFRICA" written at the left side below the map. "EMISSION MONETAIRE DE L'INSTITUT DE DEVELOPPEMENT DE L'AFRIQUE CENTRALE * IDAC *" (clockwise) starting from 3 o'clock around the map. Mintage: 2,500. Minted Years: One year type. This coin is also made in bi-metallic as X#25a (Copper-nickel center and Brass ring. Weight: 5.25 grams. Diameter: 21.50 mm) with mintage: 2,005 and in Silver as X#25b with mintage of 25 pieces only. Note: In anthropology, pygmy peoples are ethnic groups whose average height is unusually short. The term pygmyism is used to describe the phenotype of endemic short stature (as opposed to disproportionate dwarfism occurring in isolated cases in a population) for populations in which adult men are on average less than 150 cm (4 ft 11 in) tall. The term is primarily associated with the African Pygmies, the hunter-gatherers of the Congo basin (comprising the Bambenga, Bambuti and Batwa). The term "pygmoid" is a traditional morphological racial category for the Central African Pygmies, considered a subgroup of the Negroid category. The term "Asiatic Pygmies" has been used of the Negrito populations of Maritime Southeast Asia and other Australoid peoples of short stature. The Taron people of Myanmar are an exceptional case of a "pygmy" population of East Asian phenotype. X#26 1500 CFA Francs (1 Africa). Year: 2005. Weight: 7.37g [7.40g]. Metal: Iron plated Nickel. Diameter: 25.50 mm. Edge: Plain. Alignment: Medal. Mint: Africa Mint. 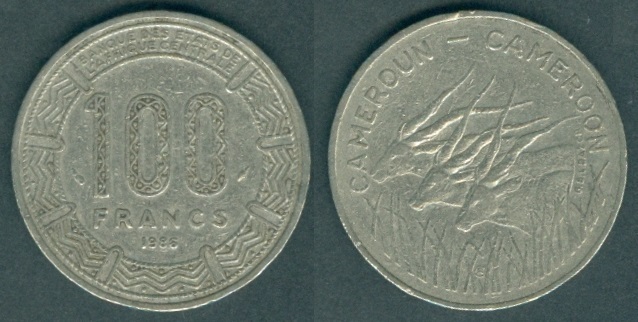 Obverse: "CAMEROUN - CAMEROON" (Cameroon) written in French and English at the top. African Primitive Coin "Mambila" (Iron double hoe money) in the center. "EM" initials above the Date. Date at the bottom. Reverse: Elephant face on Africa Map in the center. Value "1500 CFA" and "1 AFRICA" written at the left side below the map. "EMISSION MONETAIRE DE L'INSTITUT DE DEVELOPPEMENT DE L'AFRIQUE CENTRALE * IDAC *" (clockwise) starting from 3 o'clock around the map. Mintage: 2,005. Minted Years: One year type. This coin is also made in Silver as X#26a with mintage of 25 pieces only. X#24 3000 CFA Francs (3 Africa). Year: 2005. Weight: 7.44g [7.50g]. Metal: Bi-Metallic; Nickel center and Brass ring. Diameter: 26.00 mm. Edge: Reeded / Plain (alternative 5 patches each). Alignment: Medal. Mint: Africa Mint. Obverse: "HABEMVS PAPAM BENEDICTVM XVI" written in the top section. Pope Benedict XVI facing straight in the center. "EM" initials of the engraver at the left side near of the ear. 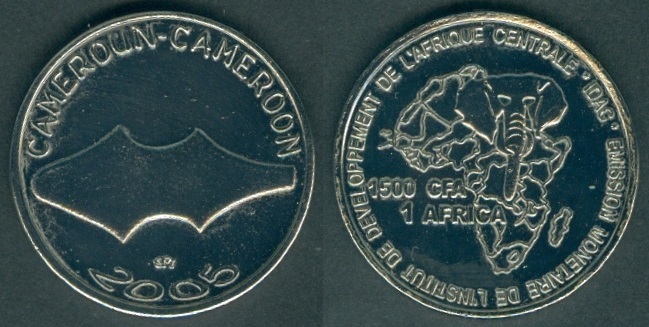 "CAMEROUN 4500 CFA 2005" written at the bottom section. Reverse: Elephant face on Africa Map in the center. Value "3 AFRICA" written at the left side below the map. "EMISSION MONETAIRE DE L'INSTITUT DE DEVELOPPEMENT DE L'AFRIQUE CENTRALE * IDAC *" (clockwise) starting from 3 o'clock around the map. Mintage: 2,005. Minted Years: One year type. This coin is also made in bi-metallic as X#24a (Silver center and Gold plated Silver ring with mintage: 25 and in Silver as X#24b with mintage of 25 pieces only. Note: Habemus papam ("We have a pope") is the announcement traditionally given by the Protodeacon of the College of Cardinals (the senior cardinal deacon in the College) or by the senior cardinal deacon participating in the papal conclave, in Latin, upon the election of a new pope of the Catholic Church. Pope Benedict XVI (Latin: Benedictus XVI; Italian: Benedetto XVI; German: Benedikt XVI; born Joseph Aloisius Ratzinger on 16 April 1927) is a senior prelate of the Catholic Church who served as its head and sovereign of the Vatican City State from 19 April 2005 until his resignation in 28 February 2013. Benedict's election as pope occurred in the 2005 papal conclave that followed the death of Pope John Paul II. Benedict chose to be known by the title "Pope Emeritus" upon his resignation. Benedict XVI was elected the 265th pope at the age of 78. He is the oldest person to have been elected pope since Pope Clement XII (1730–40). He served longer as a cardinal before becoming Pope than any Pontiff since Benedict XIII (1724–30). Benedict and his Polish predecessor John Paul II were the first consecutive non-Italian popes since the seven consecutive Frenchmen of the Avignon Papacy (1309–78). The last pope named Benedict was Benedict XV, an Italian who reigned from 1914 to 1922, during World War I (1914–18). Ratzinger chose the pontifical name Benedict, which comes from the Latin word meaning "the blessed", in honour of both Pope Benedict XV and Saint Benedict of Nursia. Pope Benedict XV was pope during the First World War, during which time he passionately pursued peace between the warring nations. St. Benedict of Nursia was the founder of the Benedictine monasteries (most monasteries of the Middle Ages were of the Benedictine order) and the author of the Rule of Saint Benedict, which is still the most influential writing regarding the monastic life of Western Christianity. The Pope explained his choice of name during his first general audience in St. Peter's Square, on 27 April 2005. On 11 February 2013, the Vatican confirmed that Benedict XVI would resign the papacy on 28 February 2013, as a result of his advanced age, becoming the first pope to resign since Gregory XII in 1415. At the age of 85 years and 318 days on the effective date of his retirement, he was the fourth-oldest person to hold the office of pope. The move was unexpected. In modern times, all popes have held office until death. Benedict was the first pope to resign without external pressure since Celestine V in 1294. In his declaration of 10 February 2013, Benedict XVI resigned as "Bishop of Rome, Successor of Saint Peter".